$470.00 Partisan Medal, 2nd cl., circa late 1940s - early 50s. Variation with raised border and "straight nosed" portrait of Lenin. An attractive example with nicely preserved details and "gilt" luster, in very fine to excellent overall condition. $295.00 Award Document for a Partisan Medal, 2nd cl., issued in October 1968 to a female recipient, probably a Lithuanian national judging by her first and maiden name. The beautiful calligraphy of the hand-written entries in the document and its date of issue lead us to believe that it was likely a "Kremlin" award. In excellent condition. 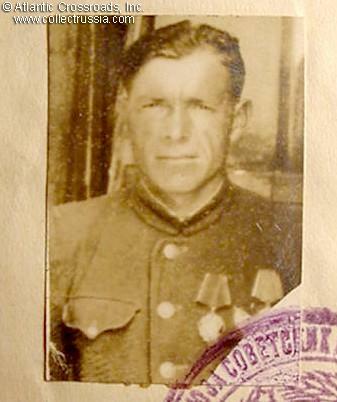 $40.00 Photo ID of a former partisan in Belorussia. Issued in July 1969. $70.00 Group of 2 documents to a woman who was a dispatch runner in a Belorussian partisan unit in 1943-44.. Includes her Partisan Photo ID. $29.00 Hungarian Partisan Commemorative Medal, miniature version for the lapel. $95.00 Albanian Order of Partisan Star, 3rd cl, circa 1960s. Excellent condition; comes with original and correct gold-colored screw plate. $85.00 Slovak Airborne Partisan Unit Vpred (Forward), veteran's badge, circa 1960s-70s. $45.00 Czechoslovak Ninth Corps Sign of Honor Badge, awarded to those who tended wounded fighters during the 1944 revolts against the Germans. $20.00 Partisan Movement of the Bryansk Region, Veteran's Pin, circa 1970s-80s. Excellent condition. $145.00 General Sidor Kovpak, an uncommon bust in Silumin alloy of the famous partisan leader wearing parade uniform and full regalia. 5 ½" in height, perfect for a bookshelf or a desk top. $245.00 "People's Avengers" A poster for the 1943 Soviet war-time "documentary film" about the partisan movement. 17 7/8" x 28".